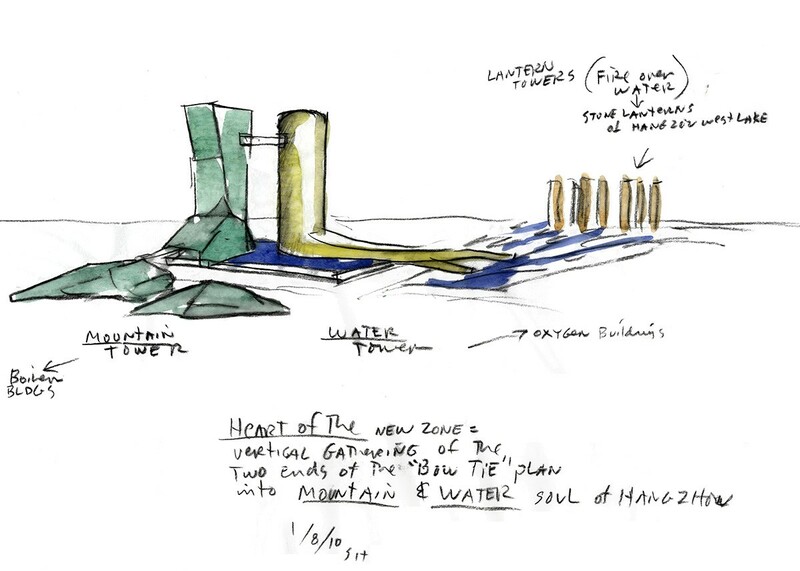 At the heart of the “bowtie” plan are the Water Tower and the Mountain Tower, alluding to the spirit of Hangzhou. The Water Tower branches into tributary forms connecting to the north, while the Mountain Tower connects via landscape forms to the south. 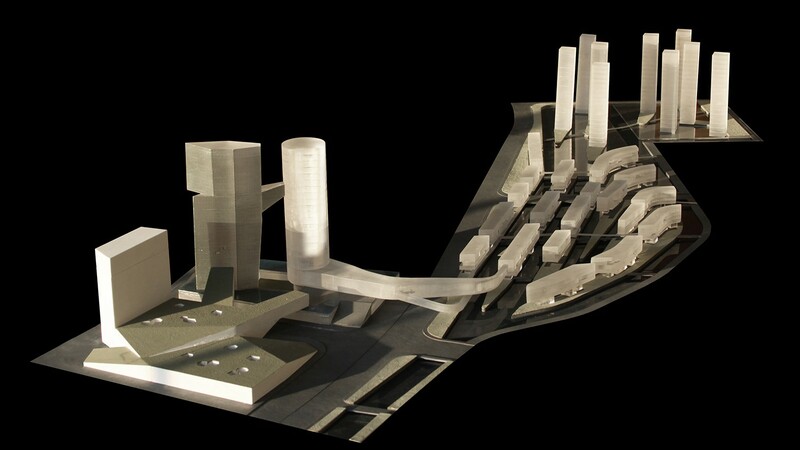 The winning design by Steven Holl Architects is comprised of five large scale elements, which hover between landform and architecture, connecting to the factory buildings at each end of the site. The round Water Tower rises from a sheet of water, connecting with a curved bridge crossing Dong Xing Road to the north. This diffused glass tower houses serviced apartments and offices with retail space at the base, and a restaurant and event space at the top. 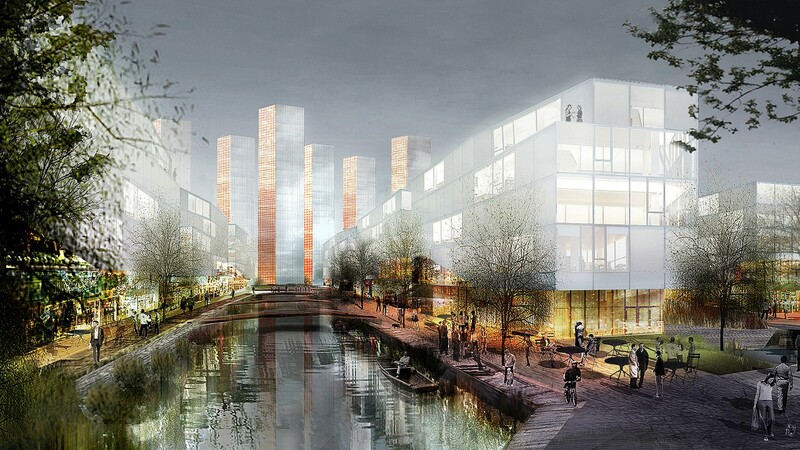 An existing canal feeds five new canals, lined with new hybrid buildings. These Canal Spreaders characterize a new zone of living by the water. They offer a variety of housing types as well as offices, cafes, restaurants and shops along the public paths at the water’s edge. 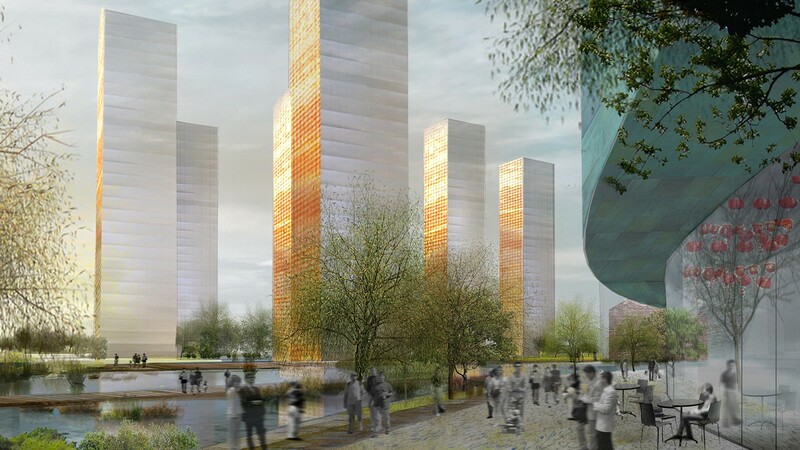 The Lantern towers take inspiration from the old stone lanterns in West Lake, setting “fire over water.” Photovoltaic glass curtain walls gather the sun’s energy during the day. At night, one elevation of each tower glows via special Fresnel glass, reflecting the day’s energy in the water. One loft apartment per floor is connected by an elevator to collective lobbies below the pond. Health club, spa, retail shopping and parking levels connect the lower levels. At the center of the site, the Mountain Tower is joined via an escalator bridge to an event space at the top to the Water Tower. 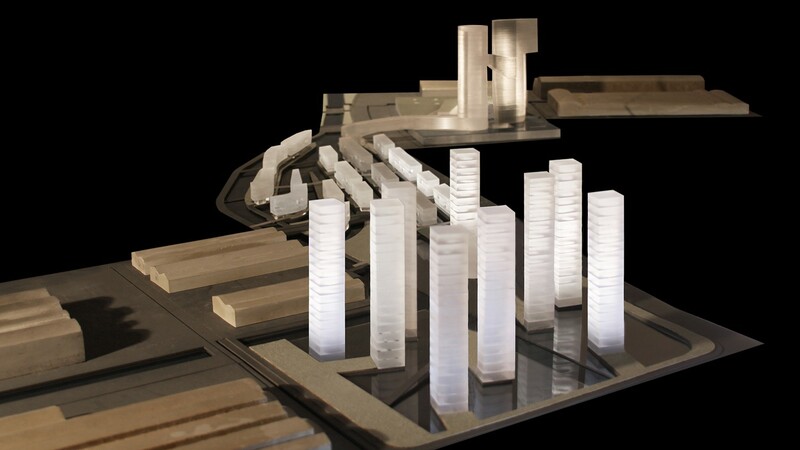 This tower of translucent ceramic skin and green roofs branches to the landscape of the 3D Park. A fusion of landscape and architecture in the 3D Park yields public green-space roofs with openings; as “gardens within gardens,” bringing nature and light to the lower levels. It is flanked by a 200-room hotel, served by a spa and restaurants opening to roof gardens, and bisected by a pedestrian link, lined with shops. 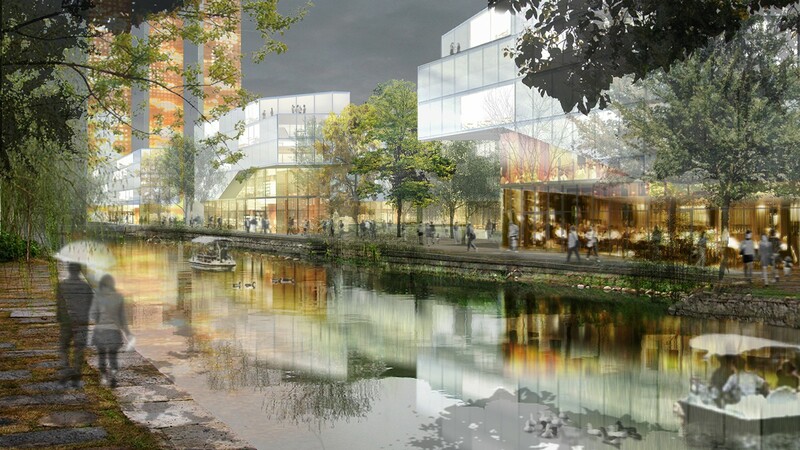 The Steven Holl Architects' master plan brings together an urban constellation with David Chipperfield Architects’s design for the reuse of the boiler factory buildings on the southern portion of the site, and Herzog & de Meuron’s reuse of the former oxygen factory buildings to the north. 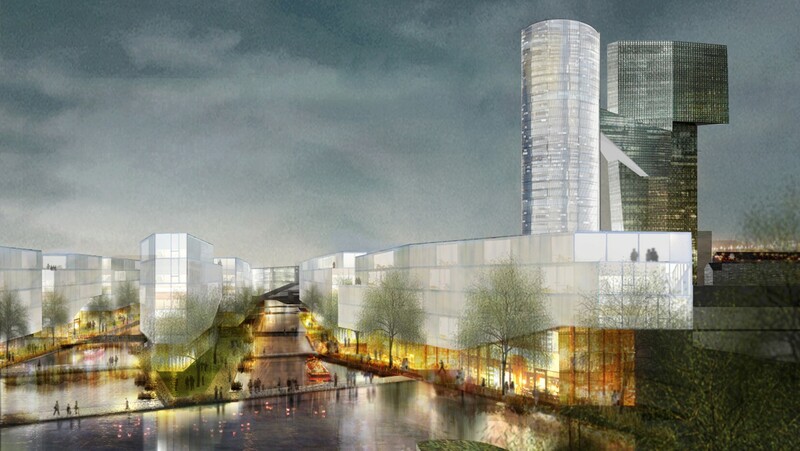 Hybrid buildings, the mix of functions, the merging of architecture and landscape, and the invigorating programs inserted into the re-used factory buildings, characterize this unique urban constellation. Aspiring to a twenty-first century urban vitality in balance with landscape, Shan-Shui will be a magnificent and inspiring new section of the great city of Hangzhou.